I popped into town on Saturday to get my hair done (sans child) and afterwards, as I was on my own, decided on a quick snoop around a few charity shops. I'm glad I did. Can you ever come away empty handed? Well, I know for a fact sometimes you can, but more often than not, you come away with something (many things). I only went into three shops as I didn't have much time to spare. I didn't find anything I wanted in the first two (well, the first one had a massive mirror that I thought would look amazing in the garden, but it was £25 and we're a bit broke) but the third shop came up trumps. 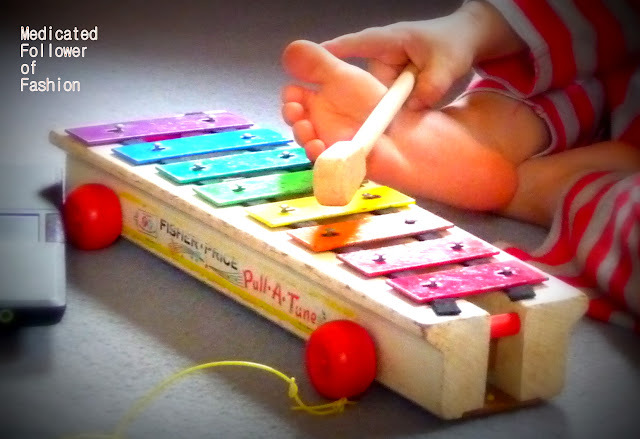 Firstly, I spotted an old Fisher Price "Pull-a-Tune" xylophone. It didn't come with a mallet with which to bash out a tune, but that didn't concern me, we have copious things at home that can be used. It's not in fantastic condition, but good enough and it still works brilliantly. I'm a real sucker for old Fisher Price toys, and I like them looking used anyway, shows they've been enjoyed! I knew Ethan would love it. As soon as I brought it home, he was running around with it making a racket. For £4.50 I think it was worth it. I believe it dates from 1964 having had a google. As well as the xylophone I grabbed "Balderdash" - an amusing board game. My parents have it. We're trying to increase our board game selection, so for £3 this came home with me. Have you got any second hand bargains recently? Do you like charity shopping? *sighs* they don't make them like that anymore do they? They really don't.. I'm so lucky, my parents kept all of my toys, so Ethan gets to play with loads of old stuff! I love Fisher Price, our camper van is 30 years old and still going strong! Oh fab, I covert the fisher price camper van! My hubby's parents have one with Ethan plays with round there! It's gorgeous, it really is. I love how used it looks! I can't remember if I played with one of these myself, but I played with loads of other fisher price stuff.. I love xylophones - all those bright colours lined up! But this retro one just takes the cake!